Here is a complete, fully-illustrated guide to the most versatile and effective saltwater lures in ever devised—diamond jigs and bucktails. Expert angler Tom Migdalski details specific methods for catching striped bass, blues, cod, pollock, bonito, false albacore and many other gamefish—what tackle to use and how to rig and fish the wide array of diamond jigs and bucktails available to the saltwater angler. 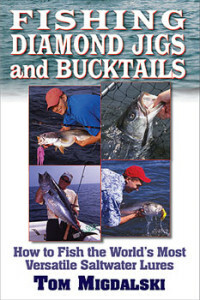 Tom Migdalski is a widely-published writer on saltwater fishing, writing for Salt Water Sportsman, The Fisherman, and many other publications.